Picture is an example, yours will be similar. Colors will vary. Traditional music is an important and integral part of east African culture performed at many festive ceremonies, religious events, and political rallies. The Nyatiti is an eight (8) stringed instrument similar to the medieval lyre from the Luo community in Nyanza province, near Lake Victoria, Western Kenya. The Nyatiti is commonly played solo by plucking usually played with a single singer, and sometimes light percussion or bells, in praise songs. The batiks are produced following standard templates. Although similar no two are identical even by the same artist. Each one is unique and an individual tapestry. From a distance the batiks will appear to be identical, close inspection will show slight differences in color patterns and design due to the work being done free hand. Also, background colors may vary slightly from the listing photographs due to different batches of dyes and style of background finish. 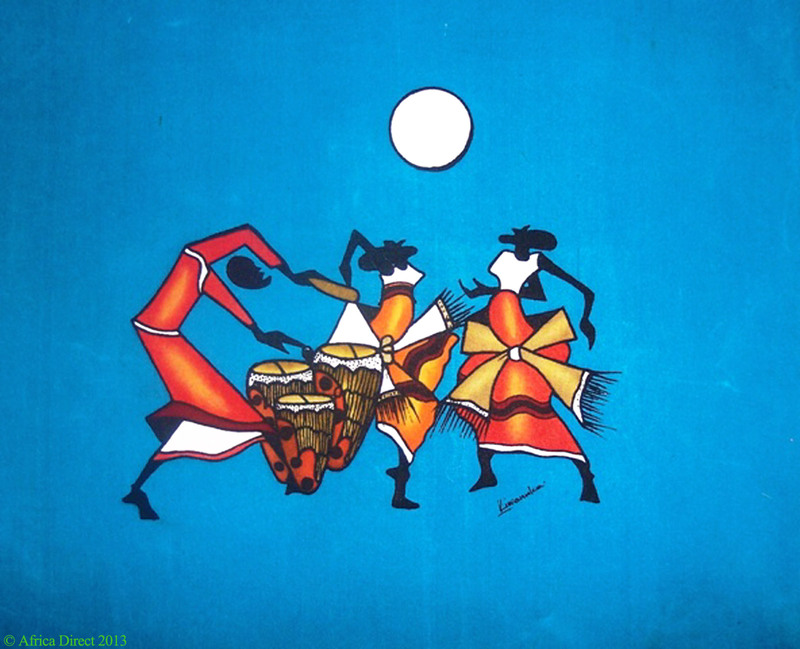 The unframed, pastel, paint and pen batik, on 100% medium to heavy African cotton canvas is a magnificent and unique tapestry. Kiwanuka, a Ugandan-born artist has several studios throughout East Africa. The studios have many artists; however, all are produced under the original founder’s signature to his original designs, colors, and templates. The batiks offered are produced mainly from the Thika facility about 100km from Nairobi in Kenya.